Talk of Yuletide may feel premature with temperatures still in the teens but Santa comes early to Spacehive. 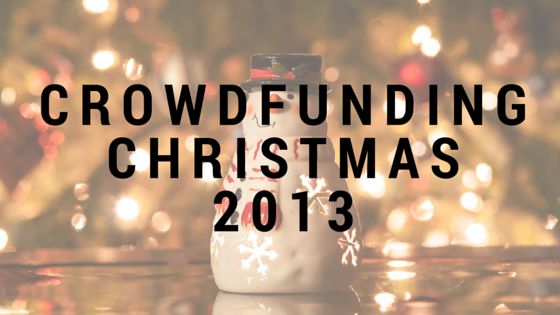 Savvy towns are warding off Scrooge by crowdfunding the cost of keeping the Christmas lights on this festive season. What better way of bringing local people, businesses and the council together than adorning the town with some festive getup? We love it. Does your town need a bit of Xmas magic? Create a project now. 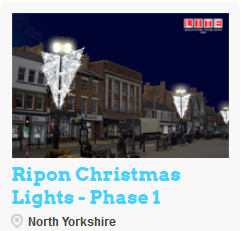 Ripon wards off Grinch by crowdfunding £9,581 of Christmas cheer. The North Yorkshire town is first off the festive blocks with a successful £9,581 campaign to keep the lights on this year after 40 local people and organisations chipped in to make the town sparkle. Council in festive pact. 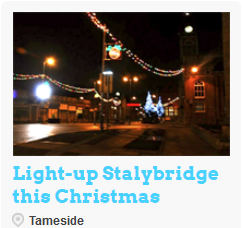 Christmas cheer is hanging in the balance this year as the Stalybridge Town Team races to reach the £2,757 target needed to make the town twinkle this year. Fortunately the council have offered to match what the crowd raise so a heartwarming ending is in sight. More sparkle please. 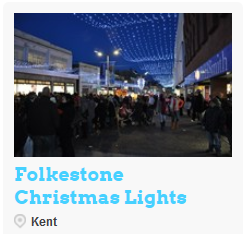 Folkstone already has a set of Christmas lights ready to crack out. But the town wants to get extra festive this year. This crowdfunding campaign – which is uniting everyone from local people, retailers and the council – will double the amount of sparkle in the sky above shoppers. Bring your own project to life with Spacehive, create a page now.